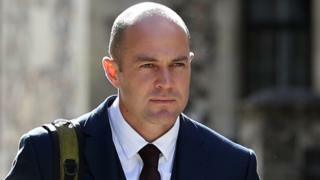 An Army fitness instructor accused of attempting to murder his wife caused a gas leak at their home by loosening a nut on a valve, a court heard. Victoria Cilliers suffered multiple injuries in a 4,000ft fall at Netheravon Airfield, Wiltshire, in April 2015. Prosecutors allege Mr Cilliers, a sergeant with the Aldershot-based Royal Army Physical Training Corps, twisted the lines of her main parachute and sabotaged a reserve chute the day before she jumped. He is also accused of damaging a gas valve at their home a few days earlier. The court heard Mrs Cilliers reported smelling gas after her husband had spent the previous night at his barracks because he said he wanted to avoid Monday morning traffic. Jurors were told an engineer called to check the leak found a loose nut on a gas isolation valve in a cupboard next to the oven. Dried blood was also found on the pipe, which the court has heard matched that of Mr Cilliers. They were shown a set of pliers which prosecutors claim were used to loosen the nut. Emile Cillers said he used the pliers to tighten it but had been unable to do so because it was too tight. Forensic scientist Mark Kearsley said the markings from the pliers had been used in a "loosening and not tightening motion". He said: "The nut must have been in a tightened position to lead to the impression we had, if the nut was loose it would just have turned with the tool." Gas engineer Michael Osborne said he was called to the Cilliers' home on 30 March to make the gas leak safe. He said it was not unusual to find such a leak and explained that as well as a tool, the nut could have become loosened or "relaxed" by repeated changes in temperature or by being knocked by food tins being placed in the cupboard.